I received a very apologetic letter from Legend Press yesterday. Apparently my order for ten books never went through (although the money was taken from my account) so it will be another seven days before I receive anything. So not happy- and I know that there are other authors who have experienced similar problems- but at least I got an apology and promise of action. This means that I have been unable to send out any review copies, which is the next stage of my marketing plan. Over the past couple of days my Amazon rankings have been falling, then today they suddenly shot from 167,000th to 19,000th. Either my forage into facebook has worked, or there is a ‘word of mouth’ going on. Thanks to everyone who has bought ‘Tasting the Wind’ so far (and that’s not just friends and family but people from the States, Canada, Australia and elsewhere.) And thanks for the positive feedback. If you go onto the Amazon or Book Depository sites and where you are asked for book title enter ‘YouWriteOn’ you will get a list of YWO published books in order of sales. At the moment ‘Tasting the Wind’ is at position 6 (out of about 350) in both. BUT BE WARNED: it can brcome addictive. 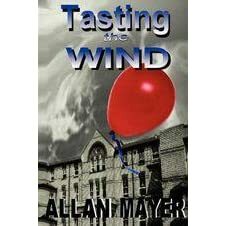 Tasting the Wind on Amazon and Book Depository. I also found that if I searched for books published by YouWriteOn on Amazon, ‘Tasting the Wind’ is now at sixth place. Thanks to everyone who is buying it. Hope you enjoy it and hopefully feel moved to write a review on Amazon. As I mentioned before I have set up a FaceBook group. This weekend I set my mind to other ways in which FaceBook can be used. I’ve also put Tasting the Wind onto FaceBook marketplace. It appeared at first not to accept my ad. but I then got a confirmation e-mail saying that it had. And I’ve been trying some targeted marketing. It occurred to me that there are themes in the book which certain groups on FaceBook might find interesting. So I went into the ‘Groups’ function and searched for ‘Learning Disabilities.’ This came up with 500 groups, some of them with several hundred members. I also found a group with over a thousand members, devoted to the delights of the Staffordshire Oatcake. I have left a message on there because when we first meet Martin, our hero in Tasting the Wind, he is living in a flat above an oatcake shop- based on the one in my birthplace, Kidsgrove. The one thing not to do is to paste the same message onto several sites- FaceBook won’t let you- so you need to write an individual message each time. It’s a bit like doing a leaflet drop, without leaving your home, and targeted at people you know may already have some interest.